Even though kids and their parents would like nice weather for the holiday, Halloween weather can often be a trick rather than a treat. Close your eyes and picture Halloween. You probably see trick-or-treaters. They might be a little chilly, but they are most likely happily getting candy in a neighborhood experiencing typical fall weather. This is what Halloween normally looks like. However, the scariest monster that may scare trick-or-treaters on Halloween is often Mother Nature. If you just look back over the past 30 years, you’ll see plenty of crazy weather events that jeopardized every candy lover’s favorite holiday. 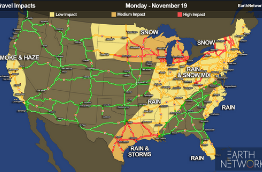 In fact, you probably experienced one of these tricky Halloween weather days yourself. Before you start reading, subscribe to our blog now so you don’t miss out on our next post like this one! 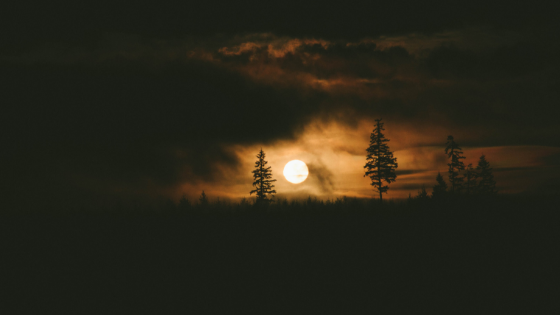 Now it’s time to turn on our Halloween playlist and get spooked out reading about all the craziest Halloween weather experiences in recent history. When Mother Nature tricks some of us she can also treat some of us at the same time, depending on where you live. That’s exactly what happened on Halloween in 1989. 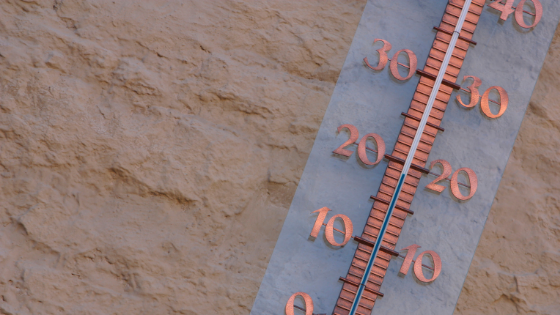 Nine cities in the southwestern U.S. reported record high temperatures for the date. For example, Phoenix, AZ had a reading of 96 degrees. This was definitely a treat for trick-or-treaters who could wear any type of costume they wanted. There aren’t any treats without tricks on Halloween though. 22 other cities in northeastern U.S. reported record low temperatures for the date. A low of 19 degrees was recorded at Cleveland, OH. This was a record for the month of October. Both Allentown, PA and Bridgeport, CT tied October morning lows at 21 degrees. While these high and low temperatures aren’t nearly the craziest Halloween weather conditions, they definitely made things tough for kids all across the northeast. Two years later, the Perfect Storm prevented trick-or-treaters from leaving their homes. Also known as the “Halloween Storm” and “The No-Name Storm,” the weather events of Halloween 1991 were some of the most extreme on record. 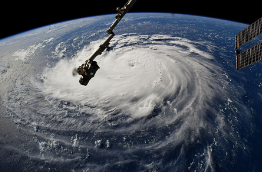 This storm happened when a nor’easter absorbed Hurricane Grace and ultimately evolved back into a small, unnamed hurricane late in its life cycle. 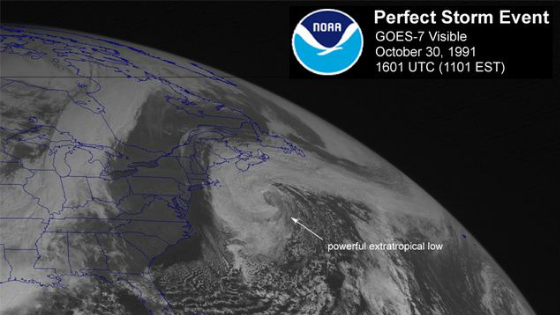 It was known as the perfect storm after NWS Boston Deputy Meteorologist, Robert Case, described the convergence of weather conditions as being “perfect,” for the formation of such a storm. This damaging storm formed on October 28 and killed 13 people before dissipating on November 2. Besides costing children across the northeast precious trick-or-treating time, it also cost the U.S. a scary $200 million in damages. Most of the damage occurred while the storm was extratropical along the coast. It caused waves over 30 feet high and left more than 38,000 people without power. The majority of damage occurred in Massachusetts and New Jersey. If the “perfect storm” sounds familiar to you but you weren’t alive during it or directly affected by it, you’re not going crazy. This storm caused the sinking of a sword fishing boat, Andrea Gail. The storm and the boat’s sinking became the center-piece for the non-fiction book The Perfect Storm (1997) and the major Hollywood film adaption in 2000 starring George Clooney. The next decade or so was pretty quiet for crazy Halloween weather. While technically not in the realm of meteorology, 2003 saw a series of solar storms that peaked right before the holiday. Known as the Halloween solar storms, this series of solar flares and coronal mass ejections occurred from mid-October to early November. These solar storms generate the largest solar flare ever recorded by the GOES system. While these storms, which peaked around October 28-29, didn’t really affect Halloween, they did have plenty of impacts around the world. These storms affected satellite-based systems and communications. The SOHO satellite failed temporarily, and the storms damaged the Advanced Composition Explorer (ACE). The solar activity was so intense that astronauts aboard the International Space Station (ISS) had to stay inside the more shielded parts of the Russian Orbital Segment to protect themselves against the increased radiation levels. There were also impacts here on Earth. Scientists warned aircraft to avoid high altitudes near the polar regions. The solar activity even caused an hour-long power outage in Sweden! It wasn’t all bad though. You could see aurorae at latitudes as far south as Texas and the Mediterranean countries of Europe. 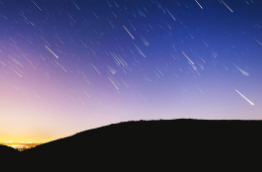 Aurorae are brilliant displays of bands or folds of variously colored light in the sky at night. 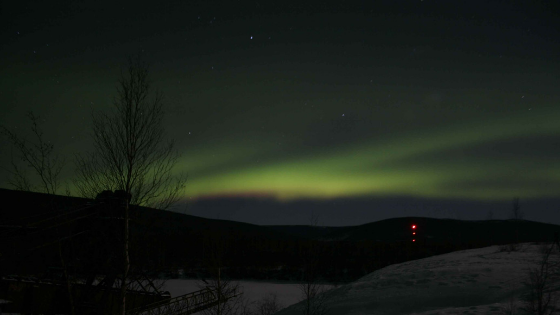 The most famous aurorae are of course the Northern Lights. 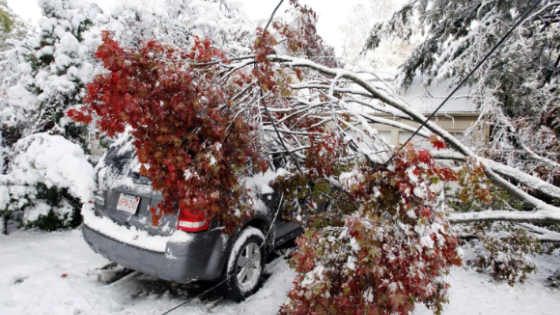 The next incident of crazy Halloween weather on our list is the 2011 Halloween nor’easter. Also known as “Snowtober,” “Storm Alfred,” and “Oktoberblast,” this 2011 storm broke snowfall accumulation records in at least 20 cities. This stormed formed early on October 29 to the southeast of the Carolinas. As it moved up the East Coast, this large low pressure system shocked the Northeast just two months after Hurricane Irene made landfall. 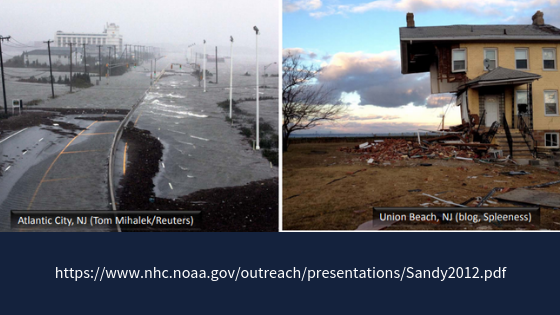 “Snowtober” did plenty of damage before it moved out to sea on November 1. Most of this was due to the fact that most trees in the northeast were still in full leaf. When the snow fell and sat on the leaves, it weighed them down and caused branches to break and entire trees to topple over. These debris caused considerable damage, including widespread power outages. Estimates indicate this storm caused anywhere between $1-3 billion in damages. 39 people died as a result of the storm. Power outages rendered 3.2 million U.S. residences and businesses in 12 states dark. In Connecticut, outages lasted as long as 11 days. With regard to Halloween, some communities chose to postpone celebrations from two days to a week later. Unfortunately for trick-or-treaters in the hardest hit areas, some communities even cancelled Halloween altogether. The final instance of crazy Halloween weather on our list is Superstorm Sandy. This 2012 hurricane rocked the northeast with nearly $70 billion in damages. Hurricane Sandy was the deadliest and most destructive hurricane of the 2012 season and killed at least 233 people in eight countries. Sandy started as a low pressure system and developed into a tropical depression on October 22, 2012. The storm then rapidly intensified, reaching hurricane status and making landfall in Jamaica by the end of the day. When it hit Jamaica, Sandy had sustained wind speeds of 85 mph. These increased to 115 mph by the time it hit Cuba on the 25th. Just two days before Halloween, the storm was a massive Category 2 hurricane with a wind diameter of over 1,000 miles. Although the storm weakened before landfall, it still caused massive damage. Sandy made landfall near Brigantine, New Jersey, with winds of 80 mph on October 29. Also known as “Frankenstorm,” Superstorm Sandy impacted a total of 24 U.S. states. New Jersey and New York saw some of the worst damage. Very famously, a 50-foot piece of the Atlantic City Boardwalk washed away and a roller coaster from Seaside found a new home in the Atlantic Ocean. Power outages and floods impacted much of the Northeast. A full moon made high tides 20% higher than normal and amplified Sandy’s storm surge and overall damage. Although people want to be scared on Halloween, Sandy was a frightful experience that no one wishes to see again. It goes without saying that most communities impacted by the storm skipped Halloween or postponed Halloween that year. According to our meteorologists, the weather this Halloween will vary depending on where you live in the U.S. Unfortunately, there is a possible for dangerous thunderstorms in parts of eastern Texas and lower Mississippi and Ohio valleys. There is a chance for some tornadoes in the corridor from Austin to Houston, so trick-or-treaters should keep that in mind and keep an eye on the weather warnings and forecast updates. A few rain showers are also possible for the interior Northeast in places like New York state, Vermont, and western Pennsylvania. The northern Rockies and areas of the Northwest could also see some precipitation. It’s not all tricks from Mother Nature, though. The East will see temperatures above average before a cold front moves in later this week. Sunny to partly cloudy skies will make for great trick-or-treating throughout the region. Other areas will good Halloween weather this year include states like California and Nevada in the West and North and South Dakota, Minnesota, Nebraska, and Kansas in the Midwest.